The N.C. Chronicles. : Simple logic; Feminism vs Humanitarianism...2016 is gone, let's hope 2017 will be better.. Simple logic; Feminism vs Humanitarianism...2016 is gone, let's hope 2017 will be better..
Humanitarianism is a moral of kindness, benevolence, and sympathy extended to all human beings. Humanitarianism has been an evolving concept historically, but universality is a common theme in its evolution. 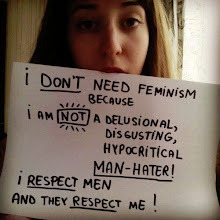 Feminism; Dislike even hatred of; self, others, independent thinking, masculinity, femininity, free speech, etc. Then you have those (feminists) who have been brained washed to not take personal responsibility for their surroundings, even raising kids(in this case a boy) and find a comfortable way out for their idiocy and blame someone else for their weakness of thought. Living in a free society means everyone has the right to be who they want to be, as long as it does not impede on others rights. Even if one chooses to be a feminist. It also means people have the right to oppose and debate illogical thinking which confuses and guide the young in a twisted idealism. We hope they like been...alone and limited, in their surroundings and thinking. 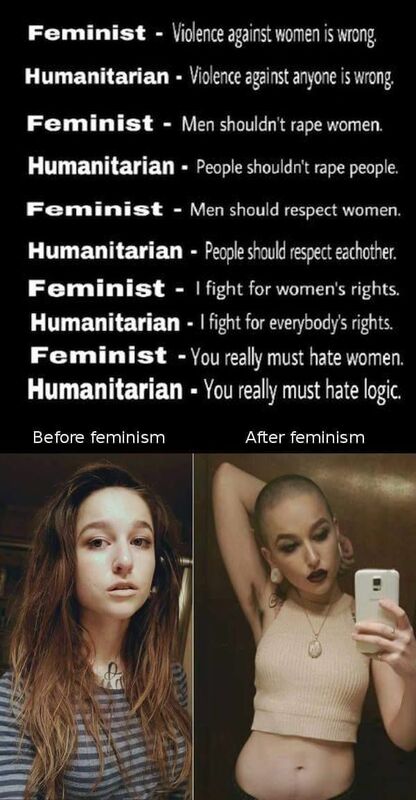 Feminism has been contained, It has been stopped in it's tracks, not only by the mrm but by men and women who know the difference between hate and human nature, their number have been falling because of stupid statements. Men and women have had enough of rampant idiocy, sure it (feminism, snowflakes, sjw) will be around for a while yet, but because of their twisted ideals of what humanity should be, they have committed self destruction by attacking, instead of debating and recognizing that not all think the same way. When they refused to adapt and improvise to human thinking and free thought, that not all think the same, their fall was imminent. Such is human history, those who refuse to evolve, who promote hatred, always end up in the graveyard of history. Feminism has basically become a joke, one doesn't have to go far to see it. Inside of one generation, they will all be gone and the rest of us can live in peace, instead of been blasted with their illogical unnatural B.S..
Or, just f*cking ignore them. And once in a while, put up the stupid things they say and promote, so people can actually see for themselves what these fools truly represent.